I know, I know. It’s been only a few posts back where we fell down the “Eat To The Beat” rabbit hole, but here I am, the very next week, posting on a Blondie song that I just can’t get out of my head today. That’s the price we pay for the haphazard fashion in which I craft this blog! In many ways it makes perfect sense that after listening to “Union City Blue,” what must have been dozens of times last week, that I would eventually get a yen to hear its close cousin in sound. After I played it the first time this morning I thought to myself, that this simply must have been a Nigel Harrison song, since the song’s traits are so closely related to the wondrous “Union City Blue” and my instincts were spot on. The biggest difference in this song was how the song lacked the expansive buildup on the back of Clem Burke’s drums. This one bolted from the gate at full speed with [I’m guessing] Frank Infante’s nimble guitar giving with the utterly glorious riffs that all of the cascading drums and percussion are playing a secondary role to this time out. The riffing was clearly influenced by Jimi Hendrix’s “Third Stone From The Sun” but its placement in a buoyant, ecstatic pop song couldn’t be more different. And the song does indeed soar, not only due to the powerful guitar, but also thanks to the legendary backing vocals of Flo + Eddie, who blend with Ms. Harry to winning effect. This was the one song on “Autoamerican” that just sounded “big” and next to all of the eclectic tributaries away from the Rock River on that album, it ended up being my clear favorite on an album which has always been something of an acquired taste for me. Lyrically, the song surprises since with Blondie’s retro kitsch rep, one would think that it was about the car, or maybe a street gang, but it’s actually about the Native American totem from whence everything else cribs the name. The middle eight has a spoken word recitation by Ms. Harry that 36 years of listening has not fully divined. The constant, tribal percussion throughout the song was another nod to the religious significance of the titular bird, but did you notice how the roller-rink organ of Jimmy Destri played against this beat throughout the song, giving a touch of ska to this number? In fact, it was somewhat redolent of the rhythmic keyboard sound of the previous year’s “Flex” by Lene Lovich albeit cross-bred with the closest this album came to Phil Spector territory. I find it hard to believe that this track was never released as a single anywhere in the world, but closer examination of Blondie’s output in 1980 reveals that all three of the singles they released that year went to number one in America [and all over the world, for that matter]. Yow! Is that world-straddling success, or what?! Of course, from this acme, things could only go downhill for Blondie. But that’s another story for next time. This entry was posted in Core Collection, SOTD and tagged 1980, Autoamerican, Blondie, Flo + Eddie. Bookmark the permalink. Can I just say, T-Birds is my favorite song on Autoamerican. The album was a bit of a let down for me after the immensity of Eat To The Beat, but it had it moments, this one being by far the best. Debbie’s spoken word and layered vocals, the brightness of the keyboards/organ/synths and those guitars! I have a greater appreciation for Autoamerican 35 years on, it’s still not a go to Blondie album, but with tracks like T-Birds, Rapture, Angels On The Balcony and the “Chic goes to Marakesh” sound of Do The Dark I don’t completely discount it. Echorich – You sound just like I do when on the topic of “Autoamerican.” Yeah, it was a queer Blondie album; neither fish nor flesh, but as I pointed out both of the singles from it went to number one in our country, so somebody loved it! It definitely plays better with time. The big question is, how does “The Hunter” stack up? In its time, it was an even bigger disappointment and one without all of its singles being number one hits! It is the single classic canon Blondie album that I never bought on CD… still! Must correct that, right? My issues with The Hunter are pretty specific. It suffers from songs with too much filler in them. Someone told Debbie she should Rap some more, but this time on songs that sound like Ric Ocasek left unfininshed lying around a studio. The Beast has one of the most boring guitar solos of all time on it to compliment (?) Debbie’s stream of consciousness rapping. Warchild is a good song ruined with too many 70s-isms- some parts are utterly Prog to these ears… Danceaway lacks the “Blondie Girl Group” sound to make it sound authentic. In the end, their cover of The Hunter Get’s Captured By The Game is a bright spot, but I’ve always wondered why Debbie didn’t save that for her solo album. Looking back, nothing was really well at Blondie HQ around this time. Too much drugging, internal friction, Chris Stein’s illness and his and Debbie’s straining relationship added to an album with little focus or purpose. Echorich – “Someone told Debbie she should Rap some more, but this time on songs that sound like Ric Ocasek left unfininshed lying around a studio.” Wow! It’s been 33 years since I’ve heard it, but that really triggers a response that suggests you are 150% SPOT ON with that comment! Yeah, the wheels were coming off of the platinum New Wave vehicles. Blondie was first man down. The Cars still had one [huge] victory lap left in them, but they would have their “Hunter” in 1987. It was up to The Police to exit on top with all of the marbles. If “Warchild” is Prog, then its a weird DanceProg hybrid. I have the 12″ of that and it’s not bad, really. Strident, but it sort of works, which sets it apart from much of the rest of the album. I think AutoAmerican is utterly fantastic, and it’s bananas eclecticism really works for me this time (unlike, say, on Panic of Girls or No Exit or Debravation). I get tingly just hearing the spooky sci-fi intro to Europa, knowing I’m about to go on an incredible journey. Anyway, back to the matter at hand, T-Birds is most assuredly a mighty piece of pop. What I wouldn’t have given to hear Debbie sing it (and Angels On The Balcony) live back in “the day.” Or now, for that matter. As for The Hunter…I’ll leave that particular beast alone until such time as the Monk posts a review of it. Except to say that now I find a lot to love on it, whereas upon release all those decades ago I thought it rather stillborn and lifeless. Taffy – So “Debravation” didn’t work for you either? Interesting. I am convinced that “Def, Dumb + Blonde” was a total keeper – as good a Blondie’s best, then “Debravation” slipped me a Mickey and the next thing I knew, I was off the Blondie bus for good. I’ve heard nothing past 1993. I just looked at the credits for “Debravation.” Talk about “too many cooks” syndrome! Not even Guy Pratt involvement could save that thing! Why did DD+B hold together for me? Good question. Mike Chapman? Taffy – I quite liked “I Can See Clearly” but the rest of the album just passed right through me. Fascinating to hear a about the “director’s cut” of that album. It was news to me. sorry for all the typos/autocorretions. the worst is the I’ve which should read live (as in…”live back in the day”). Taffy – Don’t apologize for typos. There are no editors now! I’ll correct the worst of them [maybe] as a courtesy. Your live set comment reminded me that when I saw Deborah Harry live the single time it happened, it was on the fabbo DD+B tour, and wouldn’t you know it… She performed every track from that opus – except for my favorite one, “Maybe For Sure,” natch! “Autoamerican” is my fave Blondie album by a mile,the only one I still play regularly. “T-Birds” is indeed a classic,such a memorable piece of work and has a retro vibe without sounding old-hat. I still have the original promo cassette of “Debravation” from the record company and when the official version came out I was stunned to hear the difference-a great album for me,as is DD&B. glad to be back online after a few weeks with no access due to house move! Lots of PPM to catch up with! I like your list Monk, I think I would whittle it down by one and reverse your #1 and #2. But it could be a bit of a toss up – the debut’s earnest passion, amphetamine pace and Punk Girl Group affectations or the sonic immensity and document of a band firing on all cylinders of Eat To The Beat. I certainly can’t do without either one! 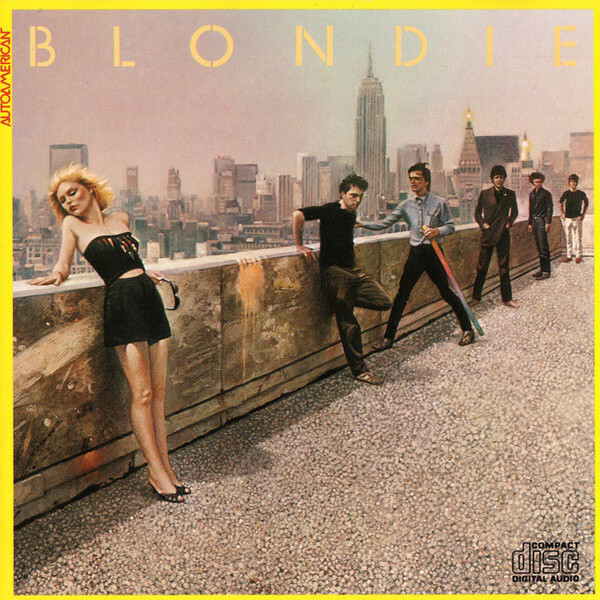 Echorich – When I calmly, rationally, sit down and contemplate it, ” Blondie” was the seminal album that defined a New York postmodern trash aesthetic and launched a thousand New Wave bands in a definitive way. “Eat To The Beat” was a much more mainstream concoction. Perfect, in a way, but the beast had been tamed. Disciplined. It varies with the days, but this day I had to give the edge to the debut. I can’t argue with that Monk. I literally grew up with Blondie, the same way I grew up with Talking Heads and The Clash. These three bands seemed to evolve as I evolved from a teen into an adult. Each have a personal peak for me that I can map out along with peaks in my own growth Eat To The Beat, More Songs About Building And Food and London Calling all mark moments in that process for me. 2000 years ago a great race of roller derby (golden headed?) warriors lived in South and Central America, and they had many Gods. Mixtecs and the Toltecs and the Mayans. Xibalbay, Godzilla, Gargoyle, Mayan, Mazatlan, Mazatlan. Mayan warrior, my oh my. Charlie M – Welcome to the comments! Yeah, I think I found those eventually, years ago. It seems that Blondie may have been mixing the myth of the Thunderbird with the feel of the car for some post-modern mojo very much up their alley.